"When God asked Solomon, 'What should I give you?' Solomon's heart and mind were still in worship mode, so God could talk to him," Trotter told the audience. "When our mind and hearts are in worship mode, God can talk to us; God will ask us questions. He will give us opportunity because we are in worship mode." He directed the audience's attention to verse 10 where Solomon asks, "Give me now wisdom and knowledge to go out and come in before this people, for who can govern this people of yours, which is so great?" Solomon was humbled and satisfied that God would choose him to lead His people, and we can certainly learn from him, Trotter said. When God asks us to do something, we should be: "humbled, and cause us to look up to God in humility, instead of being filled with pride or arrogance." He went on to say Solomon asked for wisdom and knowledge because he knew he would need these attributes to govern God's people properly, as mentioned in Proverbs 1; 4:7; and 8:11. Wisdom is not common sense, he explained. Common sense is what people think is right, not what God says is right. Because wisdom is from God, wisdom will always produce the correct response. As Trotter gave his message, "amens" and claps rang throughout the sanctuary. Leaders from various African American churches across the state contributed to different portions of the program. Rev. 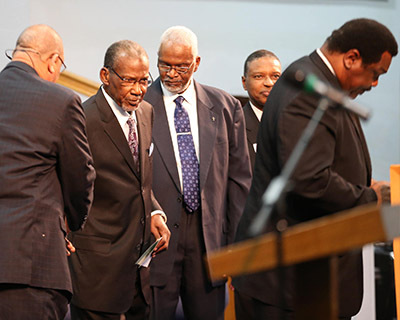 Elmo Johnson, pastor of Rose of Sharon Missionary Baptist Church in Houston, served as master of the ceremony and a special offering was taken for Charlie Singleton, director of African American Ministries for Texas Baptists. Singleton extended his "thank you's" to the pastors and those in attendance, saying he's been immensely blessed. He encouraged the audience by saying, "Things are changing. People are changing. Generations are changing, and have to be addressed in a different way. … If we work together as a convention, we can lift the name of Jesus Christ. Not for ourselves, but for Him." 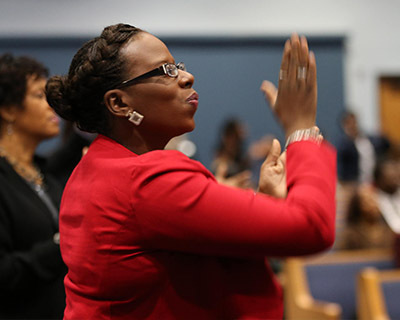 The African American Fellowship was one of three rallies, which took place Sunday night commencing Texas Baptists' 2015 Annual Meeting, which will take place through Tuesday, Nov. 10 at the Dr Pepper Arena located in Frisco.